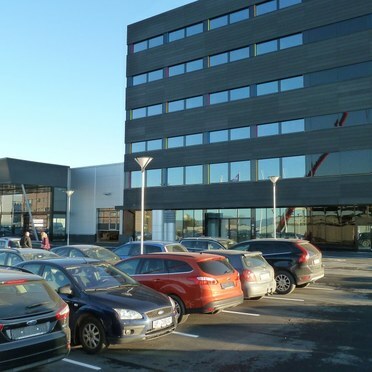 When Kverneland Auto Garage decided to convert an old seed store in Trondheim, central Norway, into a 6,300 m² area suitable for a modern car showroom and workshops, the criteria for the lighting had to change too. Good colour rendering, a high level of comfortable illumination and a commitment to sustainability and the environment were clear priorities. The new scheme uses Thorn T5 fluorescent luminaires (Optus IV) with sensors, for detecting both daylight and presence. Depending on where the luminaires are mounted a sensor registers the daylight light level or movement in the room, and dims the light so that the amount of light is always sufficient. His judgment has been rewarded by a Class A energy rating for the building (Norwegian energy classes are labelled using letters from A to G, with A being the most efficient). Kverneland is Norway’s second, and the regions first, auto garage to gain a low energy, Class A, rating. “We are pleased that we have found solutions that meet the requirements on the type of building we wanted to build and work in,” added Veie. Dealerships also know the importance of well lit outdoor showrooms and forecourts. To ensure that the vehicles are presented in a proper manner, the company consulted the local Thorn Lighting manager, Knut Martin Selli, who recommended Areafloods on ten metre columns. The optical design of the Areaflood is notably different from normal area floodlights, being based on the Champion sports projector. It has an inclined front glass and integrated visor giving a full cut-off and providing a ‘virtual’ light emitting surface. The result: illuminance and uniformity are optimised, glare minimised and obtrusive light avoided. One final refinement is that the garage wanted to get away from using unsightly emergency lighting luminaires and having to undertake regular testing, manually. 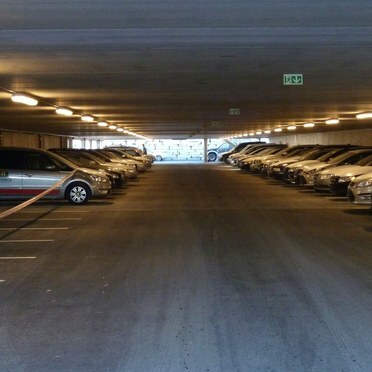 The solution was to install an addressable Voyager LED emergency lighting system in the auto garage. Selli feels that LEDs are set to change emergency lighting luminaires beyond belief. “They are so much smaller with perfectly tuned optics that improve spacings, significantly reducing the number of emergency luminaires required. This means lower install cost and the longer light source life, reduced battery strain and size, and ease of testing will significantly reduce through life cost and environmental impact,” says Selli. Kverneland Auto Garage convincingly demonstrates that with modern equipment and good lighting management it is possible for a company to dramatically improve working conditions and reduce lighting electricity consumption.